The last few weeks in San Francisco haven’t been wintry, not even California wintry. It’s common for us to take a break from rains at this time in late January and early February — call it “Springuary” — but this period has been exceptional. Many days have actually been summer-like as I’ve walked in Golden Gate Park, preparing for my fall show at the SF Botanical Garden. A winning combination of sun and rain have produced sumptuous blossoms in the City, and none more spectacular than the magnolias at the SFBG. Even when the warm sun sets, the magnolias glow at dusk. In slideshow order, these are the images: 1.Sierra Redwood, SF Botanical Garden; 2. Japanese Maples, Japanese Tea Garden; 3. Yulan Magnolia (with pink magnolia bokeh background), SF Botanical Garden; 4. Warm sunny mid-day at Stow Lake; 5. Great Blue Heron at Waterfowl Pond, SF Botanical Garden; 6. Torrey Pine sunset, SF Botanical Garden; 7. Pink tulip magnolias at dusk, outside Friend Gate of SF Botanical Garden. In a BinaryEndgameBottomlineEitherOr world, it’s nice to head to the park and find beginnings living side by side with endings. 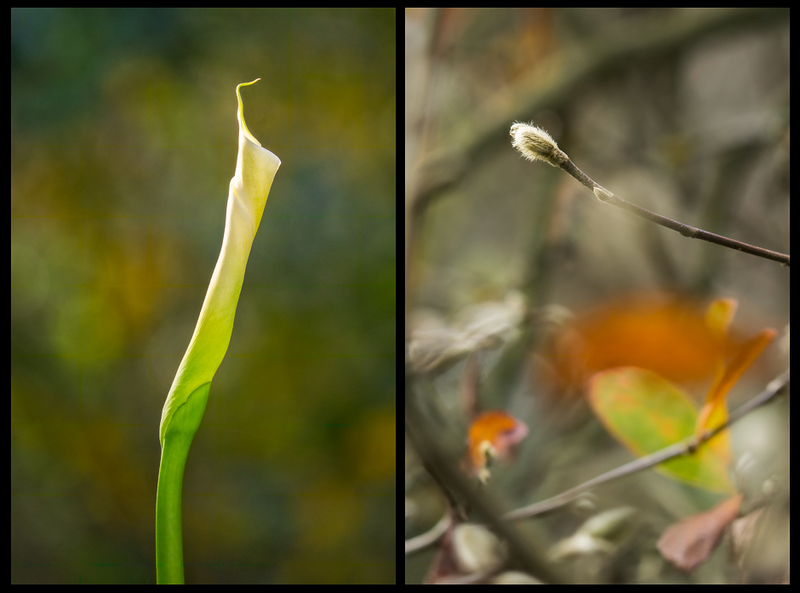 At the San Francisco Botanical Garden on Saturday, you could see autumn leaves and spring buds on the same magnolia tree, and a callow calla catching light with fall color behind it.